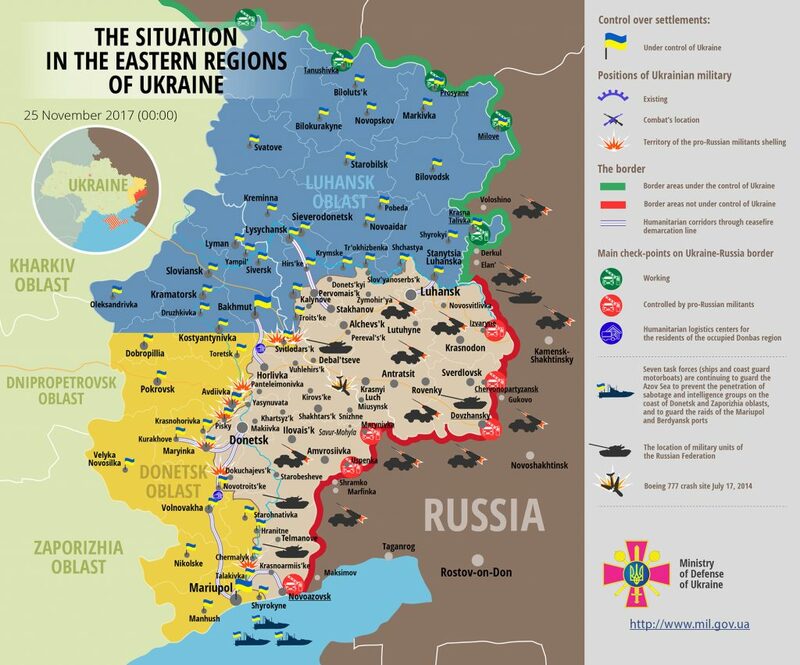 Last night the situation in the ATO zone remained tense. The militants continued to shell Ukrainian positions with weapons prohibited by the Minsk agreements. In total militants attacked positions of Ukrainian Armed Forces 17 times. The Ukrainian Ministry of Defense spokesman on ATO Colonel Andriy Lysenko reported this at a press-briefing at Ukraine Crisis Media Center. In Luhansk sector, Russia-backed militants made nine precision attacks upon Ukrainian positions. At night, militants shelled Ukrainian positions with 120 mm mortar near Novoluhanske, with 82-mm mortars – near Luhansk and Lozove. “During the day militants also attacked the same positions using armament of BMP, grenade launchers of various types, large-caliber machine guns, and light weapons,” Colonel Lysenko added. Ukrainian troops returned most of the attacks from the weapons not proscribed under the Minsk agreements. In the Donetsk sector, Russia-backed militants made eight precision attacks upon Ukrainian positions. They conducted precise attacks using the armament of BMP, grenade launchers of various types, large-caliber machine guns and small arms in the areas of Avdiyivka, Mariinka, Pisky, Shakhta Butovka, Berezove, Hnutove, and Verhnyotoretske. “The enemy also released 4 mines from an 82-mm mortar at Ukrainian position near Pisky” – reported Ministry of Defense spokesman on ATO. Ukrainian Armed Forces incurred no losses yesterday. “Moreover, two servicemen, who were considered dead during a clash near the Krymske, due to their considerable combat experience and courage, were able to escape from the zone of enemy defeat and return to their units,” Colonel Lysenko added. Report on the military developments as of November 24 is available here. Interactive data on the shelling: chronology shelling chart and the interactive map.